CLICK HERE for a YouTube Video about us! Do you like fruity wine and enjoy a casual atmosphere? Well, you found it at Old South Winery! 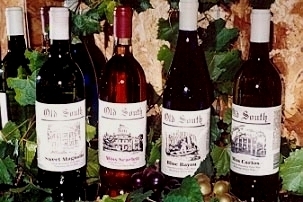 "The Best in Everything Muscadine" has been our motto since Old South Winery opened in 1979 on property which Dr. Galbreath bought over 50 years ago. Our special Southern grapes are native to the coastal Southeastern USA and are cousins of bunch grapes. Muscadines are an American grape with a European name! How confusing!?!?!? The Galbreath family buys only the finest & freshest muscadines from Mississippi growers for our wines, and continues its heritage of winemaking, using the most advanced techniques to capture the true essence of the fruit. The largest selection of Muscadine Wines anywhere!! Visit our tasting room for other muscadine products: jelly, hot sauce, pepper jelly, t-shirts. COST: Free tour & tasting for individuals and small groups. Large groups pay per person and must call in advance for reservations.